Drum Session’s main screen is easy to navigate if a little on the grey side in terms of cosmetics. There are some brilliant electronic drum apps available for iOS. However, for those wanting realistic acoustic drum parts, while a few apps have come close, we don’t yet have a candidate for ‘EZ Drummer in an app’. Which is something that Blue Mangoo, the developers behind the excellent iFretless apps, are trying to achieve with Drum Session. The app is not intended to be an iOS clone of something like EZ Drummer, but the aim is to provide a straightforward way for non-drummers to put together a realistic drum track with a minimum of fuss. The app ships with around 30 different acoustic drum kits and over 3600 MIDI-based drum patterns, both of which are organised into genre-based categories. 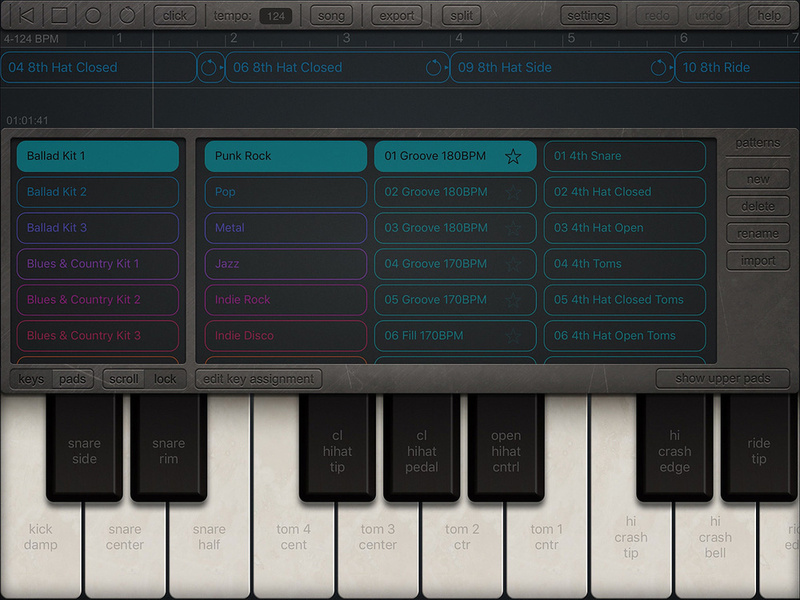 MIDI in/out is supported, as are Audiobus and IAA although, at this stage, there is no Ableton Link or AU support. Most of the action takes place in a single main screen. The kit and pattern browser sits in the centre and, having selected a kit, you can then simply drag and drop patterns into the timeline strip above the browser to construct your song. This really is very simple and the timeline includes editing tools for functions such as copy, paste and duplicate. The lower portion of the screen can be toggled between a virtual piano keyboard or drum pad display for triggering the sounds, although you need an external MIDI keyboard/pad in order to exploit the velocity sensitivity built into the sounds. If you drag a pattern down into this lower area, a piano-roll-style MIDI editing environment appears. This allows you to edit the existing patterns or create pattern of your own, and you can also record patterns live. The MIDI editing tools are perhaps best described as functional rather than elegant, but it has enough features to get the job done. Once you have constructed your song, both audio and MIDI export options are included as, in one form or another, you can easily get your drum part into your DAW/sequencer for inclusion within a wider project. What you don’t get (in the initial release at least) is any means of building your own custom kits from the included samples, or importing your own samples. Nor do you get a virtual mixing environment where you can adjust the relative levels of the various drums within your kit or the amount of room ambience applied. You simply pick the most suitable kit and live with it. These are perhaps the most obvious ‘missing in action’ features compared to the better desktop virtual drummers. However, as the kits themselves sound very impressive and the selection of patterns is equally so, it really is very simple indeed to put together a complete drum track in a matter of minutes. You don’t get quite the same playing dynamics offered by the many multi-sample layers available on the desktop but, thanks to a combination of some multi-sampling, and I suspect some clever use of EQ/filters, it is pretty close... and certainly closer than the price tag might lead you to believe. There is also an impressive selection of performance articulations for each kit, so you can add lots of realistic touches. OK, so Drum Session is not (quite yet) an ‘EZ Drummer for iOS’ but it is not a million miles away and, for many iOS-based music makers, might be just what they need to create a realistic drum track with the minimum of effort.